Truth Unveiled: Which Electric Razor is Perfect for Teens? As a guy, the ages of fourteen to fifteen represent some of the most transformative years of your life. During these years surrounding puberty many changes can occur, including the growth of facial hair. You want to start out by having pleasant experiences when it comes to using a dedicated electric razor. That describes my relationship with the electric razor. So, I want to help you achieve the same positive outcome. Among Electric Shaver: Foil or Rotary? Quick Tips for Teens: How to Shave with Electric Razor? Facial begins to grow at various ages, generally between 9 and 15, for different boys. Some people look at it as one of the initiations into manhood. Thus, no age serves as the universal age to start your shaving endeavors. Parents should ultimately decide. First, it depends on if you have enough hair to shave. Then you should make sure you know how to safely operate the razor. Get tips to shave smoothly. This works best after showers or baths as warm water relaxes the skin. It takes time to do it right. And that little cuts and grazes comes with the territory. The skin of adolescent boys hasn’t gotten used to shaving yet. So lather your face with shaving gel or lotion. Avoiding irritation goes a long way. Shaving with the grain helps in this case too. Completing the shaving process includes cleansing his face and applying moisturizer. Some boys opt to use electric razors because they cause less irritation. Keep this in mind just in case. As you can imagine sharp razors work best. Definitely consider getting yourself a new razor to begin. Later in this article I will review some of the pros and cons of razors. Which Type of Razor Will Be Appropriate? Three main types of razors exist: straight, disposable and electric. Straight razors have a blade those folds into the handle. These razors saw a lot of use before the 1950s. Beginners would not find this option easy to use. These days’ barbers make use of the straight razor to edge crisp hairlines. Disposable razors gave people an alternative to the straight razors. These razors add an extra element of safety. They offer convenience as well since you can throw them away after use. Many people lean towards this direction for shaving. Electric shavers cut away hair swiftly. Many of these razors charge quickly. You don’t have to learn about aspects like angle, pressure or grip. They don’t absolutely require gels, lotions, shaving cream etc. These shavers glide over skin meaning less cuts occur. You can control the level and evenness of facial hair. They have incredible advancements in the design of the blades. You will save money in the long run. Treat it right and it can last from months to years! Electric razors have changed the game. They combine efficiency and effectiveness very well. The breakthroughs in technology and design keep getting better. I will differentiate between the two types of electric shavers for you. In this section I will explain the best type of electric shaver for teenagers. Congrats on making the decision to begin this exciting journey! People consider foil shavers very appealing. This type generally comes easier to understand. Let its simplicity work in your favor. They can get into tough places. You will appreciate it while getting near your nose or around your goatee. If you love convenience know that foil shavers satisfy that category in cleaning and maintenance. You can just use liquid soap and water. And you will never have to take it apart to do so. The rotary shaver occasionally needs you to clean each blade. You opted for electric shavers to get away from dealing with extra parts. Again, I choose to speak on behalf of what I believe will help newbies. Some guys will have other preferences. Pay attention to the facts, which I stated. Those will prove true no matter what! You don’t need to burden yourself with anything. Treat yourself to a pleasant experience. Once you get the basics down then feel free to experiment. Consider that you probably have many years of shaving ahead of you. Next thing you know you will bestow this information upon others. Given all of the good that comes with electric shavers, you still need to choose the right electric razor. You want to get started on the right foot. Many people have had bad or unfortunate experiences to begin. You will avoid this by taking my advice. Teenagers generally have sensitive skin. You want to take care of it with the long run in mind. Staying well-groomed says a lot about you. It can help you get the job you want. Who doesn’t want to leave a good impression on others? When you use a good electric razor your confidence will rise. That will help you in many aspects of life. Consider yourself fortunate to have come up on this information. It will save you time and trouble. Bad razors have the potential to pull hairs. You should not experience any pain while shaving. In fact, you should look forward to it! Selecting an electric razor will make all the difference. You want a convenient electric shaver. As a beginner, you this will make your life easier. You should aim for something that works for a wet or dry shave. Versatility makes for a very useful factor. You will have this electric shaver for a while so take your time choosing one. Pick the electric shaver tailored to your needs. If you have ingrown hairs, select based on that. You may consider how close the blades can trim. Shavers will differ according to each individual’s preferences. Get an electric shaver that incorporates simplicity. The beginner stage doesn’t require you to have tons of gadgets and gizmos. Once you use it, you will have to keep it. So, choose very wisely. You will thank yourself in the future! You can achieve some spectacular results by selecting the right electric razor early. This will help you develop your skills faster. It will take the pressure off of you. Remember that people consider shaving an art. Give yourself time to get better. Your success in this endeavor lies with choosing a quality electric razor. It will help you feel a certain independence! You should feel excited. Definitely, feel free to shop with a guy who has more experience than you. Turn the razor on and off before you use it. This will help you get used to the vibration. You may even want to try your razor out on your arm. Don’t get crazy with this. You will better grow accustomed to the feeling on your skin. You can even practice on your shoulder. Then move to your neck. A dull razor will do you little to no good. Exchange the old blade for a new one ideally once a week. Your other option lies in getting a new razor. A dull razor will leave you more susceptible to cuts and irritation. Exposing your skin to warm or hot water will open your pores and soften your hairs. This makes for a more precise and easy shave. Use your sense of touch to graze your hair to know when you should shave. Combine that with your sight and you will find yourself in great shape. Many guys feed into various misconceptions. One means that just growing a beard will eliminate the need to shave. However, you will need to outline the edges and even your beard occasionally. You may find it easier to make certain faces to get in particular areas. This will help when shaving around your nose. Try puffing your cheeks as if to hold your breath. Ask your dad or another respectable male where your sideburns end. Especially, because you want them to look symmetrical. Shave in front of a mirror that doesn’t require you to hold it. You want your hands to focus on shaving alone. Wipe the blades after three to four strokes. You don’t want hair to accumulate. This will prevent a smooth shave. Use your hands to feel your face. If it feels smooth all over, then you did well. Don’t worry if you miss some spots. Just go over them again. With precision German craftsmanship, you cannot go wrong when choosing this shaver. From personalized shaving to 8-D contour adaptation, everything has been taken care of for this product. I love it! Beard and mustache trimmers can make a huge difference in the life of any male. So many electric shavers have come out. This can cloud your decision on picking the right one. Reading this review will help you pick the best trimmer on the market. Our top pick came down to the Braun Series 7 7865cc Wet & Dry Electric Shaver. The Braun Series 7 7865cc Wet & Dry Electric Shaver has plenty of benefits. It has advanced technology that will win you over. This technology gets a feel for your beard, then adjusts to it. If you have more hair in certain area this shaver uses more power. So, you won’t find it difficult to get a clean shave. It has sensitive mode if you have delicate skin. Other models include turbo and three others. You simply press a button. This means you have complete control. These modes allow you to customize your shaving experience. These elements bring efficiency to the equation. They cut more hair per stroke than other trimmers. This allows you to do the job in less time. As a result, you will experience less irritation. You will love these aspects. People absolutely love this feature. The station cleans and sanitizes the shaver. It also lubricates your shaver. This will keep it sharp longer. All this happens at one charging station, at the touch of a button. Cleanliness and maintenance will add extra time to the life of your shaver. Having it cleaned hygienically will eliminate bacteria. You want to avoid infections at all costs. The lubrication will increase the trimmer’s efficiency. I have had a great experience using the Braun Series 7 7865cc Wet & Dry Electric Shaver. I haven’t had any bumps, razor burn or irritation. It leaves my skin feeling ultra-smooth. My girlfriend really appreciates that. The different modes came in handy for me. I have sensitive skin. This shaver gets the job done and feels good. The cleaning station works well. It feels like I get a fresh shave every time! When it comes to getting around certain places this shaver stands out. It gave me the ability to maneuver smoothly. It doesn’t take much practice to use it either. Newbies will feel confident using it! If you pick Braun Series 7 7865cc Wet & Dry Electric Shaver, you will definitely get your monies worth. It outperforms many other shavers in different categories. Functionally this razor will last a long time. People new to shaving will enjoy using this product because it doesn’t take them long to get used to it. It is also comfortable to hold which definitely helps. It accommodates your face in the best way no matter if you have a sensitive skin or thick hair. On top of everything, Its eye catching design is good enough to attract any teen looking for a stylish shaver. Why We Chose Braun Series 7 7865cc When the Latest Series 9 Is Available? Braun does have other high end shavers such as the 9090 and the 9095. So, you may still wonder why we chose the Braun Series 7 7865cc. We chose the series 7 for good reason. Consider the information below as it will help. And keep in mind that newer doesn’t always mean better. First of all the series 9 comes in bigger sizes that weigh more. Safe to say this doesn’t make it any easier to get around certain facial features. The replacement heads cost more for the series 9 shavers. The series 7 wins in terms of hair removal effectiveness as well. It saves you time by cutting hair faster. Many people find that the series 9 products require going over a particular spot many times. Otherwise they won’t get all of the hair there. The cleaning system doesn’t come compatible to other Braun shavers. Thus, it loses some useful convenience. Many people consider this an unnecessary hassle. You will get more bang for your buck with the Braun Series 7 7865cc. It has proven more durable and long lasting. Its performance exceeds that of the series 9 in multiple categories. Save yourself time and trouble by taking our advice. 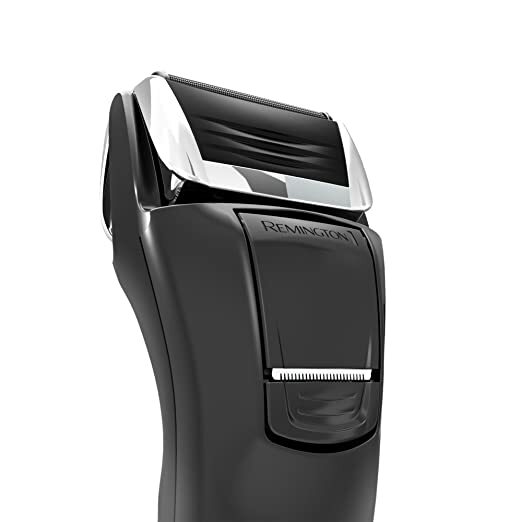 You will thoroughly enjoy the Braun Series 7 7865cc over the series 9 shavers. I felt the Panasonic ES-LV95-S Arc5 Electric Razor Wet/Dry earned the runner up position. It sports a five-blade shaving system. The 30 degree blades produce close shaves. You will also achieve a smooth shave. It gets the job done in a quality fashion. It cuts in 14,000 cycles per minute and has sensors to feel for beard density. The latter feature will automatically adjust to your beard. The Panasonic ES-LV95-S Arc5 has a Multi-Flex pivoting head. Using this you can better maneuver in certain areas. You will enjoy the enhanced comfort as well. This electric razor also has an automatic cleaning and charging station. And don’t worry it dries the shaver too. The ES-LV95-S Arc5 features a pop-up trimmer to make crisp lines. This will come in handy for your mustache and sideburns. The flexible micro foil patterns will definitely work in your favor. It makes use of a special lift technology. This elevates hair that usually lie down. You can thank the reverse tapered edges for that. Each layer of foil has a duty to fulfill. The ES-LV95-S Arc5 has an illuminated LCD. This feature makes it easy for you to see and switch functions. The safety lock and travel pouch make it easy for you to shave on the go. 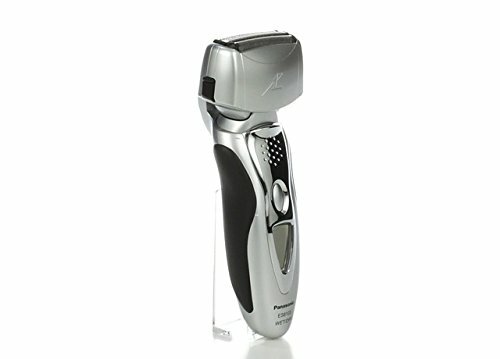 All in all the Panasonic ES-LV95-S Arc5 Electric Razor serves as another fine shaver. It doesn’t beat out the Braun series 7 but no worries. If it came down to it, you certainly wouldn’t lose with this shaver. Consider yourself in good hands! It is one of the most trusted electric shavers ever sold in market. Low priced but performs with incredible consistency. This 100% washable shaver served you the best with its wet dry feature. Now let’s just say you have a budget to adhere to. Maybe you just want to get a nice shaver for the lowest price. Either way we recommend the Panasonic ES8103S Arc3 Men’s Electric Shaver. It will meet your shaving needs and your budget. As a beginner, we understand that you may not want to go all out just yet! This shaver will help you feel comfortable from the start! Its easy use will help you feel confident and in control. The Panasonic ES8103S has some useful features. You will enjoy and appreciate them. This product will ease you into a lifestyle that includes consistent shaving. Use up and down strokes combined with side to side motions for best results. The Panasonic ES8103S glides smoothly over your skin. However, you may encounter difficulty cutting longer hairs. Overtime you will develop different techniques to get the hairs in certain places. Give it time, you got this! Performance plays a huge role in our rating system. The motor moves at 13,000 cycles per minute. This results in a fast and linear shave. You will find yourself less likely to experience pulling or irritation. As a beginner you need these outcomes. This shaver does make a decent amount of noise, but nothing crazy. So, you don’t have to worry about disturbing anyone. And of course, you want to shave in peace! You won’t find it difficult to remove the shaving head. Best practices call for you to rinse it after some uses. Once the battery life starts to fade you will see some problems. You can’t use these shavers while they charge. Try your best to avoid this situation through proper maintenance. You shouldn’t even have to worry about this for a couple years. Always best to have a heads up especially as a beginner. This shaver has a 30 day return policy and the warranty lasts one year. You should look to change the foil every year. Ideally you should replace the blade ever two years. So, even maintenance over three years would put you under $100. 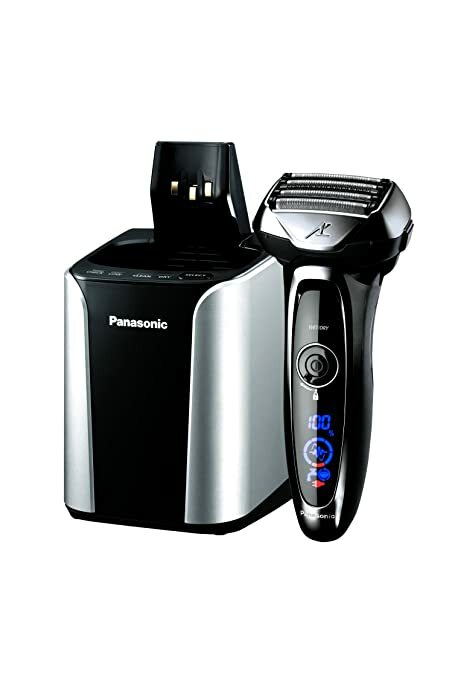 Again, we chose the Panasonic ES8103S Arc3 Men’s Electric Shaver as the most budget friendly. You will generally find it for under $100. It doesn’t get much better than that. You must keep in mind to treat it with care. At the end of the day this Panasonic shaver will do justice by your skin. Remington still stands on the market for this trusted electric shaver. Its intercept shaving technology does an amazing job sittting between the foils to pre-trim longer hairs for a closer shave. We want to do you the best service as a beginner by going above and beyond. So, we present to you another budget pick in the Remington F5-5800 Foil Shaver. This product won’t put a dent in your pocket. And you still achieved your desired outcome. First of all, you can use this shaver whether it has the cord in or not. That way you don’t lose momentum when it needs to charge. Generally, you can use it for about an hour after it has charged. This foil shaver gives you a close and clean shave. The results come in part due to the intercept shaving technology. It will cut three days’ worth of growth with no problem! And you will find yourself less likely to get razor bumps or irritation. When shaving you don’t need to move it in circles. The pivot head conforms to the structure of your face. So, you can use that back and forth or up and down motion mentioned earlier. It has a tremendous trimmer, which can cut hair lengthier than stubble. Your skin may even feel baby smooth after shaving! Once you finish shaving just use water from the faucet to clean it. You will find the Remington F5-5800 Foil Shaver simple and easy to use. The LED power display helps you make adjustments effortlessly. It definitely compliments its sleek design. Should you choose the Remington F5-5800 Foil Shaver, it will make a great impression. Keep in mind that you will most likely spend under $100 for it. You will consider it money well spent. 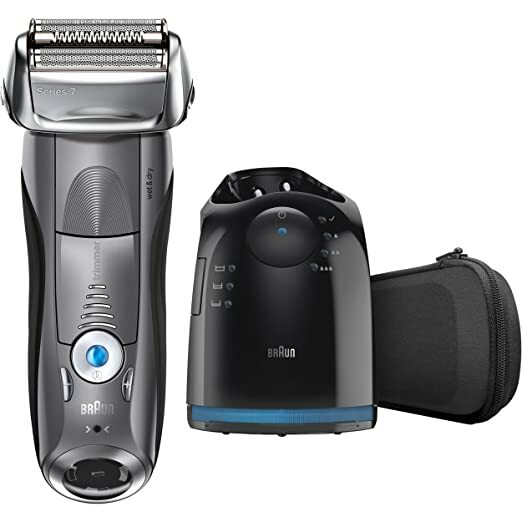 It's Braun’s most efficient & comfortable shaver for any kind of skin. With world's only 5-action Clean & Charge Station, you don't have to worry about anything about this shaver. Just - shave & go! Consider it no surprise that the Braun Series 9-9095cc Wet and Dry Foil Shaver has earned most advanced shaver. Braun knew they had to stretch to outdo the series 7. Now we wouldn’t say they did that in terms performance. However, the company did make progression in terms of technology. This technology produces 40,000 cross-cutting actions per minute. Your hair doesn’t stand a chance for this high-powered action. The head comes ready for different types of hair. Don’t worry if your follicles grow in different directions. Braun made the series 9 for heavy duty work. It gets the hair that lies flat on your skin. You will enjoy the hyper lift and cut trimmer. Other Shavers take more strokes to get the job done. The other features work well in complimenting the synchrosonic technology. The quadruple action cutting system performs based on what you need. It will make adjustments according to your face. For instance, if you have denser areas the shaver will use more power. It has an easily identifiable round power button. The LED battery display will help you understand battery status. You can move through features and functions at the click of a button. It also gives hygiene and travel lock signals. This advanced technology helps you achieve a closer shave. Braun implemented this technology so that your results last longer. This feature protects your skin from harm. No one wants to feel uncomfortable while they shave. This foil will even make your skin feel better after the shave. You can’t go wrong with the automatic hygienic cleaning. You can even select the cleaning program. The lubrication will ensure that the shaver cuts effectively. The station dries the shavers too. This process shows just how far technology has come. Sure, the Braun Series 9-9095cc Wet and Dry Foil Shaver represents a decent pick. We’d say the series 7 would serve you better. The weight of the series 9 could present a problem for a beginner. However, if you really desire to have it do what makes you happy. The saying, “different strokes for different folks” really applies in this case. Though I don't recommend rotary shaver for teens, but this shaver is incredible. With its Contour Detect Technology & V-Track Precision Blades , it can deliver 30% close skin shave easily. Rotary shavers have aroused interest in many people over the years. For beginners, we say you should go with the Philips Norelco Electric Shaver 8900. Many people will attest to its effectiveness. We know that it will do a great job on your beard. As a beginner, you want a fresh face for your fresh start! This electric shaver has no problem getting into places like your upper lip, jawline and more. Understand that it may take around three weeks for your faced to get used to it. Some people get used to this shaver right away. So, don’t worry if you experience some irritation early. The Philips Norelco Electric Shaver 8900 has features to prevent that. The V-Track Blades cut pretty close. The company advertises that the blades get 30% closer. And they cut in a smooth fashion. Take care of this shaver so they blades stay sharp. Just give the head and shaver a quick rinse. The head comes off easily. You will come to appreciate the engineering this way. You can also opt to purchase the cleaning stand. As a beginner, you may want to do that. It doesn’t make a lot of noise. This will help you maintain your focus. You will find that it holds a charge well. The travel lock mode makes sure that it doesn’t come on as you transport it. Just press the power button for three seconds. The interface features a 3 level battery indicator. Once it gets to one level you want to charge your shaver. You can expect it to last about an hour. You won’t feel any need to rush. As you can see the Philips Norelco Electric Shaver 8900 has a ton of benefits. You will not feel disappointed at its performance. Given its light weight it still has a sturdy structure. Just make sure to treat it with care. Cleaning and maintenance will prolong its life. This shaver will provide you with a pleasant experience. You will learn how to use it pretty quickly. As a beginner you want a rotary shaver that you can easily control. 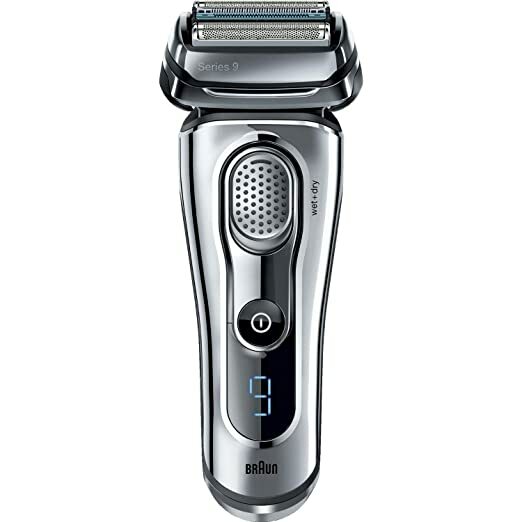 The Philips Norelco Electric Shaver 8900 will help you get better quicker. Along your journey, you will consider your beard trimmer very valuable. 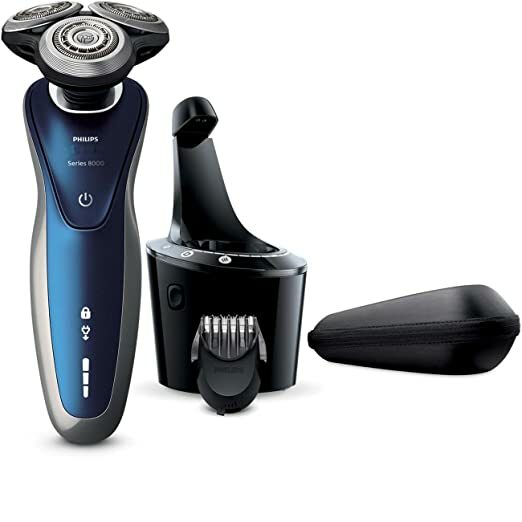 The Philips Norelco Beard Trimmer 7300 will help you look presentable. No matter the occasion you can trust this trimmer to clean up well. It makes you feel as if you have complete control. The type of control you need to thrive as a beginner. You will love the integrated vacuum system. It enables you to groom yourself without making a mess. As you cut your hair the trimmer handle secures it. So, you can expect to have a clean sink. This beard trimmer will give you the ability to cut evenly. Often beginners have concerns about maintaining an even length. Between the 18 length settings and the adjustable comb you should have no worries! If you have thicker hair use the turbo power button. This increases the speed at which it cuts. The Philips Norelco Beard Trimmer 7300 takes care of itself. You don’t have to oil it. And the blades were engineered to stay sharp. The display allows you to move between several functions. It shows battery life and length setting. This trimmer uses a lithium ion battery. You should get around 75 minutes of cordless use. It generally only takes about an hour to charge. You won’t find it hard to know when it needs to charge. I found that this trimmer takes care of business. The stubble settings come in handy. If you have a thick or difficult beard, get this product. You will finish with crisp and noticeable edges and linings. Treat yourself to this reliable beard trimmer. You will get a high quality look every time. We only believe in recommending simple and easy to use products. You will get the hang of the Philips Norelco Beard Trimmer 7300 quickly. Overall the Philips Norelco Beard Trimmer 7300 represents a great purchase. You can trust it to go the distance. Philips designed it in a durable fashion. The features make it easy on beginners. Take it with you wherever you go and enjoy! This Braun trimmer comes with simple but efficient features. The precision comb (1–10 mm) with 0.5-mm steps is enough to amaze you. And the ultra sharp blades cut any king of beard with no problem. We chose the Braun BT5070 Beard Trimmeras a favorite for budget accommodation. When it comes to trimming, some people don’t need to go all out. You may just need something easy and reliable. This trimmer meets both of those points. It has two removable trimming combs. The precision comb stretches 1-10 mm. The long beard comb stretches 10-20 mm. These will make your life much easier. They will work for achieving a 5 o’clock shadow or an even beard trim. Braun has branded the blades as lifetime lasting. Their design will make sure you don’t encounter pulling or tugging. Your beard styles will last longer. 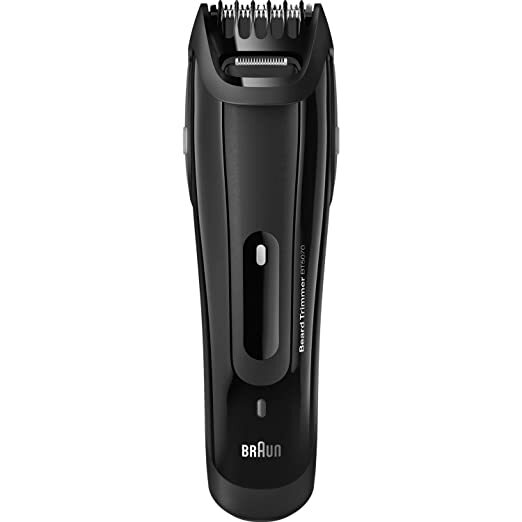 Braun designed the BT5070 Beard Trimmer for your convenience. The battery generally last around 50 minutes after charging. It takes about an hour to fully charge your device. So, you never miss a beat. Keep in mind that given the price you will need to focus on maintenance. You must take care of this trimmer. If you mistreat or neglect to do so it won’t last. Taking care of this trimmer will not feel like a hassle. Most people enjoy using this trimmer. It doesn’t have a lot of gadgets so you won’t get confused. The main focus remains this trimmers affordability. You will get true bang for your buck. So, you can feel good with your decision to buy this product! We give the Braun BT5070 Beard Trimmer for Men our seal of approval. 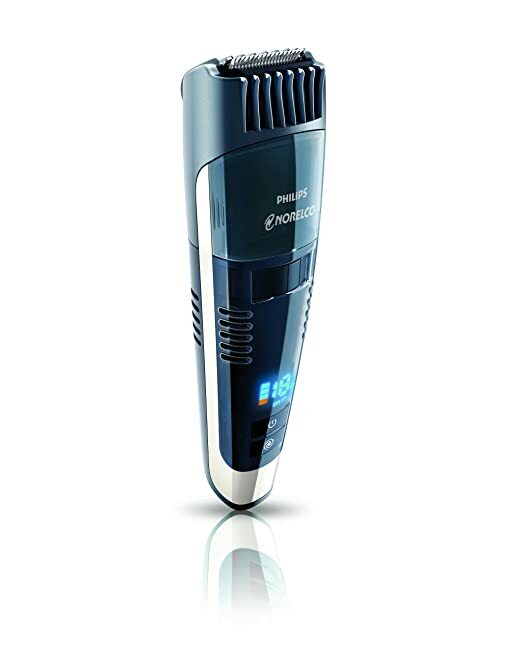 If you need a less expensive trimmer choose this. If you have a bigger budget honestly, you may want to choose another trimmer. For the price the BT5070 Beard Trimmer will work for you. Instant Grooming stands alone when it comes to offering such thorough reviewes. We give the best and most trusted insight into the best razors for beginners. Take our word for it and you will have an awesome shaving experience! Have patience and trust the process. And continue to check in with our valuable content for great tips! Braun Series 7 is still the best and the price has been reduced. However, for those who would like to upgrade, Braun series 9 has better features than 7. Umm! Your choice is good I must say! Braun is truly awesome!